The one inch punch is a strong blow that’s delivered from a one inch distance (2.54 centimeters). 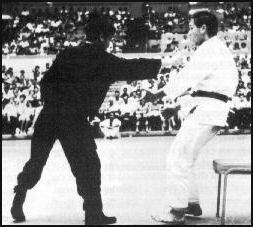 In the black and white picture above Jeet Kune Do creator, Bruce Lee, is demonstrating the one inch punch in Long Beach. When you get hit with it it knocks the wind out of you and knocks you back like the two other pictures above. To do the one inch punch you must use the 3 bottom knuckles and practice using the energy and momentum of your whole body behind the punch in one single blow. In performing the one-inch punch you need to use chi. Practicing chi energy breathing before performing the one inch punch can help you develop chi. If you’re fighting an enemy you need to clear his defenses first before using the one inch punch because it can be blocked easily. Once you clear away the defenses aim your strike to the heart, ribs, chest, or tummy. It will cause your enemy a great pain and damage those areas you strike, as well as the kidneys. Punching training seems to be neglected nowadays. Many people ignore punching trainings because they think it is very simple to punch and any punch can do some damage. WRONG. In a real fight, you will find that an average guy's punch is not enough to bring someone down or to cause significant damage, unless you are able to hit his jaw properly but that's not easy to do especially if your opponent is a boxer. If your punch is not enough to make your opponent flinch A LOT then it will take a long time before you can bring him down. Then before you knew it he was already beginning to learn your moves and planning a counter-attack, then BOOM! You're seeing stars around your head. Also, stop trying to learn as many Wing Chun forms as fast as possible. It would be best if you will master few forms first before you learn other forms. Even a newbie who has mastered a few moves like Tan Sao, pak sao, and fak sao, will be able to defeat someone who knows a lot but has not mastered any. Learn how to hit harder and more accurate. Learn the pressure points of the body so you will know where and what angle you should punch. And for pete sake, use a punching bag. Don't just practice your punch in the air. It's not gonna get you anywhere. If you don't have a punching bag then make one. It is very easy. Just find a sack, fill it with sand or corn grains, hang it on a wall, and there you have it! Wall mounted punching bags are better because it has greater resistance to your punch plus it's not going to fly around which will allow you to practice your chain punch. That's all. Thank you and good luck. Some of This Stuff is Not Unique to Wing Chun! 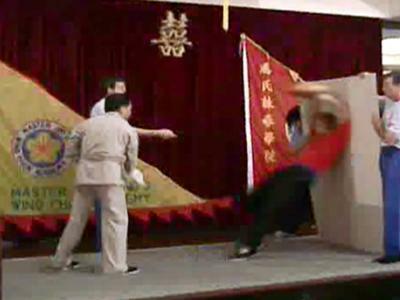 the 1-2-1-2 (roll punch) is also a common boxing technique, it could possibly be unique to an eastern martial art though. The "L-hook" sounds the same as a boxing hook, particularly one thrown at medium-long range, where your forearm ends up facing your opponent, palm facing down, as though you are throwing an elbow. And in uppercuts we don't use the arm or shoulder to deliver the punch, we use the legs and hips. Comment from Rob: I know where you're coming from. A lot of people have noticed similarities in different fighting styles. The conclusion that me and a few other training partners have come up with... There is only so many ways you can use the human body as an effective weapon. Two legs, two arms, elbows, knees, maybe head and teeth. And all our parts tend to bend in the same direction, you know what I mean? I encourage you to take up Wing Chun. It should add nicely to boxing. Wing Chun is bare knuckle, which you should find different from gloves. And you can kick, elbow, knee, and even use locks, breaks, and take downs. Plus, using deflection for defense, and executing defense and counter-attack simultaneously are great skills to develop.